Genoa is the capital of the Province of Genoa and of the region of Liguria. Many regard Genoa as having the largest historic city center in Europe as a result of having been, for centuries, a powerful commercial center seaport and city-state. It was the birthplace of Christopher Columbus and its maritime roots have fostered a dialect that has, absorbed elements of Neapolitan, Calabrese and Portuguese over the centuries. Genoa's harbor is a bustling swarm of activity, which makes it a great launching point for the sprawling metropolis of Milan. The Five Lands, a string of coastal villages linked by the sea, are part of a national park and World Heritage Site. Stroll through the quaint streets and take in a plethora of cultural sights. One of the premier destinations on the Riviera, Santa Margherita rose to prominence with the arrival of the English in the 19th century. Enjoy the lively shops and stroll along the seaside promenade. Founded in the 5th century, this Romanesque pillared basilica was remodeled in Gothic style. Inside, see splendid artwork and the earliest example of Renaissance architecture in Genoa. Cutting through the city's historic center, narrow Via Garibaldi is flanked by magnificent landmarks including the ornate Ducal Palace, home to a splendid art collection and cultural exhibits. 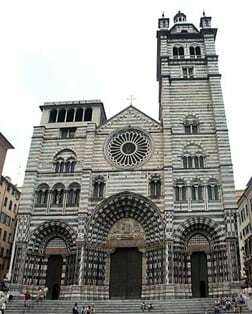 This 16th century former Jesuit church is situated near Palazzo Ducale in the heart of Genoa. The Baroque building houses paintings by Peter Paul Rubens and frescoes illuminated by bronze chandeliers. Visit Milan, the most important city in northern Italy. Experience La Dolce Vita when you visit picturesque Portofino, known as the playground of the rich and famous. Explore the colorful streets and historic sites and browse the luxury designer boutiques. Guarded by a stately 16th-century castle, the largest Riviera resort has a wonderful seaside promenade. Ride the cable car to the top of Montallegro for beautiful views of the gulf and the hills.